Access Our Thought Bank to Drive Your Safety Strategy Click Here! Leverage our expertise to manage risk in three key areas: Employee Health & Safety; Environment & Sustainability; and Enterprise Compliance. 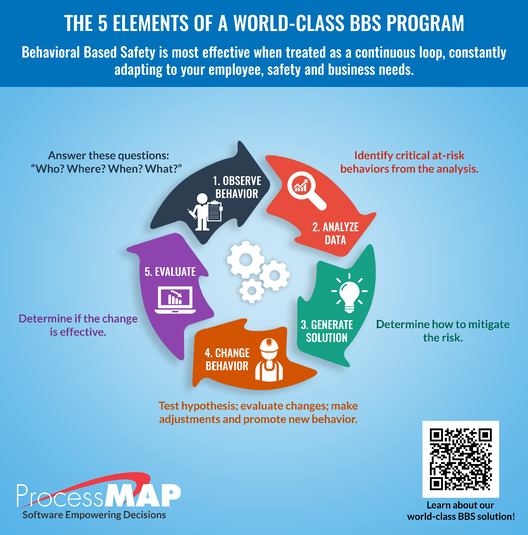 Two weeks ago, I posted The 5 Elements of World-class Behavior Based Safety (BBS): Part 1, the first post of a three-part series on Behavior Based Safety (BBS). In that post, I provided a high level overview of BBS programs and the five components that comprise a word-class program. Since the first step is pretty well understood, this post will cover the second element of world-class BBS – analyzing the collected data. The objective of the “analyze” step is to identify critical at-risk behaviors so you can generate a solution to mitigate that risk. But before you analyze data, you have to understand the basics of data analysis. The two main parts of data analysis are trending and data mining. When analyzing BBS data, you’ll start out with trending, finding the most frequently occurring and most unsafe behaviors. The easiest way to do this to rate the behaviors as “% safe” or “% not safe” and graph the information – comparing multiple behaviors to one another within a period or evaluating the trend of a behavior rating over time. This will provide a good picture of what’s going on in your organization. This graph shows a trend of observation ratings over time - %Safe vs. % Not Safe. The next and more advanced part of data analysis is data mining, evaluating each observation to identify why the behaviors are happening. In this stage, you might use more innovative tools like word clouds to evaluate the feedback and comments associated with the observations, and you might also do some staff interviews to dig deeper into issues. When you find probable underlying causes for the behaviors, you must then generate a solution. At this point, I suggest using basic scientific methods to produce and test a solution. Test your hypothesis, collect feedback on the solution and adjust as needed, and reinforce the new behavior – in order to change behavior. In my next post, I will cover the “evaluate” step, discussing metrics that will help you determine if the change has been effective so that you can continually improve performance. What procedures do you find to be critical when analyzing observational data? Leave a comment below! Behavior Based Safety, health and safefty Case Studies Featured "Mobile EHS"
© Copyright 2018 ProcessMAP. All rights reserved.